Marvel Science Fiction is a science fiction magazine that existed for a very short publication run near the end of the pulp era. For a time pulps were changing into the SF/Fantasy anthologies that would populate racks but they had a rough time of it. Published by Martin Goodman it was the descendent of Marvel Science Stories, Marvel Tales and Marvel Stories. Stating that sales and longevity of SF & Fantasy magazines in the 1950s was fair to middling is an understatement. Often the lurid covers, in an attempt to attract male readers, had the mixed result of catching a few sales but because of mature themes sales were probably lost because the books were considered for older readers and kept out of reach of younger buyers (at least as far as parental oversight was concerned). 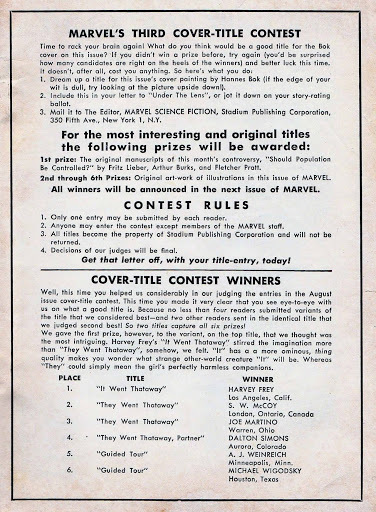 One of the ways a limited promotional budget was stretched was to offer reader contests with prizes. 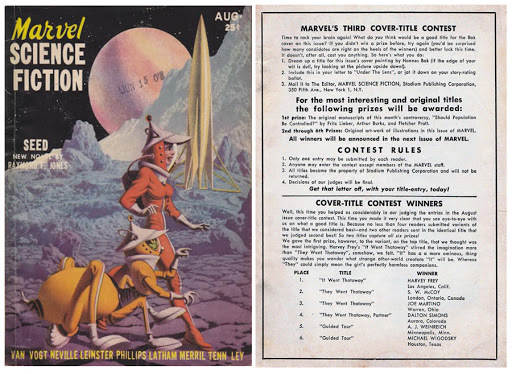 Marvel Science Fiction held a Cover Caption Contest that encouraged readers to send in funny or pertinent one-liners to accompany the cover. The prizes from MSF consisted of original scripts and artwork, a mind-boggling thing today. It was an early form of the lolcat meme phenomenon, or to coin a phrase, the beginning of the lolpulp. Until relatively recently publishers considered art for such publications as pulps and comic books entirely disposable and outside of the initial cost to the creator ultimately worthless. This was an extension of the final product likewise being thought of as worthless after initial sale. Few artists ever felt this way but that was the nature of the work for hire business model. Unless the artist had a previous deal then art was often thrown out, given away to visitors or employees or re-purposed by the publisher with no thought to the cultural value. So giving away scripts or art made perfect financial sense. Outside of postage there would be little added expense to the publisher. The results of the MSF caption contest had responses that were not the height of wit or insight. But attempts at seriousness or humor aside the great draw of winning the contest were the prizes. The first prize was a script from the issue and believe it or not, original art was the second prize. Don’t get me wrong, an original script by Fritz Leiber would be nice but a spot illustration by Frank R. Paul or Hannes Bok would be killer. I already own a few Paul illustrated pulps and they are becoming increasingly difficult to find in both good condition and in my price range. FYI, one of the most expensive vintage comics that exists has a Frank R. Paul cover, that of Marvel Comics #1 (1939). Amazing how perception has changed over the years that a script would be preferred over artwork. I’d say this change was mostly due to the monetary worth and cache of an original Hannes Bok over a typed script. The first caption contest shown here is for the August 1951 issue and the publisher is behind the idea enough to devote a full page to it. The winning entries are variations of “They Went Thataway” and “Guided Tour”. Serviceable enough. Simple enough that if I read that I’d be mailing in a thousand variations myself confident that I could put the previous winners to shame and reap all the prizes. As it turned out wit, talent and hard work wasn’t really necessary. 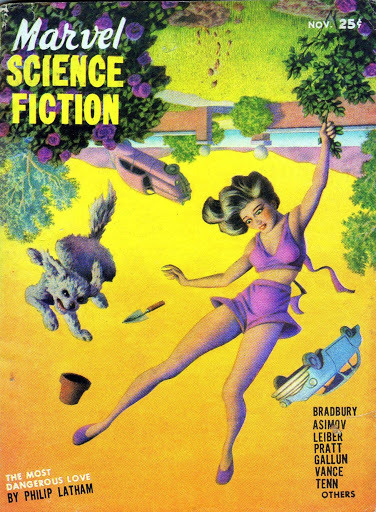 The next contest is to caption a classic Hannes Bok good girl art cover of a world where gravity fails. And that is where things go south in several figurative ways. 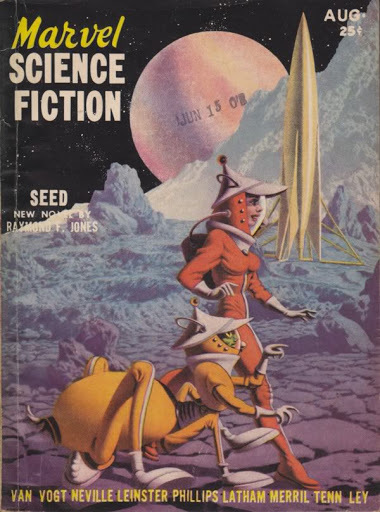 The November issue of Marvel Science Fiction was the last one before the publisher would turn to other, presumably less expensive efforts with a higher rate of return, namely Atlas Comics, which would one day revive the Marvel name. 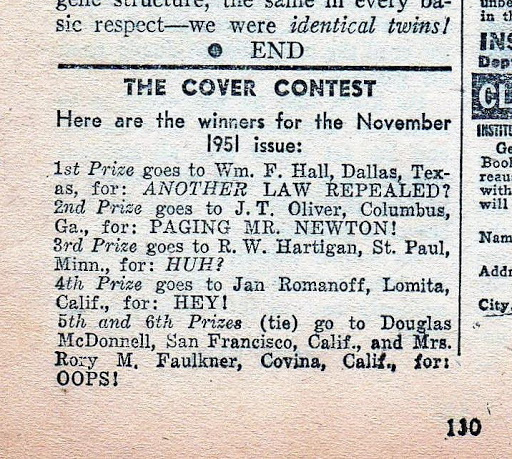 The winning entries of “Another Law repealed?” and “Paging Mr. Newton” are okay but not great and belated kudos to the winners. But in particular the last four entries were particularly uninspired and generate untold amounts of jealousy in me decades later. The winning 3rd-6th place submitted the despairingly the lame “HUH?”, “HEY!” and a tie for “OOPS!” which depresses me no end. Unbelievably these entries were awarded original art. 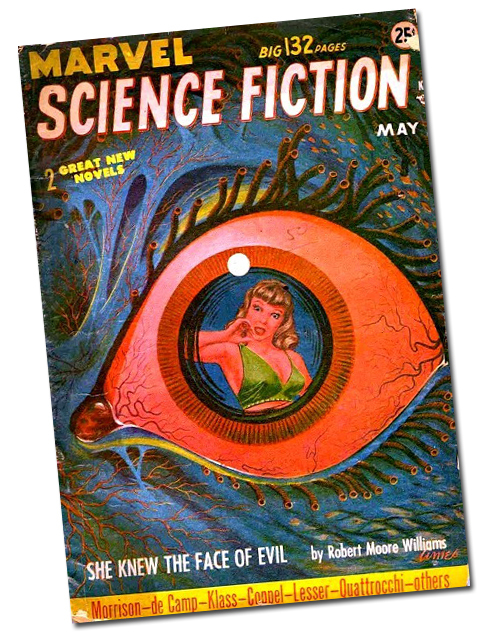 The illustrations in this issue are credited to Harry Harrison (who did illustrations before becoming an author), the legendary Frank R. Paul, Hannes Bok and veteran pulp contributor Ames. If these pieces still exist somewhere think how important to art and pulp history they would be that if in a museum or library collection. It is nearly impossible to say if the winners did or did not receive their prizes since MSF ceased publication with this issue. If they did then the people who won are some fortunate few and proof that the world is indeed topsy-turvey.